I have many different workshops that are available. Please contact me if you would like to sponsor one in your community, yoga center or ashram. Yantras, geometric centering instruments, are used to awaken the energy of various deities and planets and to make contact with our inner being. This dynamic, creative form of meditation has been used for centuries as a tool for actualizing latent potentials. Mavis will guide the selecting, constructing and painting of the appropriate Yantra for each student,including, Kali, Saraswati, Durga, Tara and the 10 Mahavidyas. A Goddess Yantra themed workshop includes Saraswati, Durga, Lakshmi, Kali and Gayatri. We can focus on one aspect or all of them. She will explain how to work with Mantra(a purifying sound). how to constuct a yantra and how to integrate them into your personal life. The 9 planet yantras, beautiful geormetric images that utilize specific colors and forms, when meditated upon, instill quietness in the mind, allowing it to positively channel the power of planets represented by each yantra. In this workshop, participants will construct and paint a yantra and will learn a mantra, containing bidj sounds, which will encourage optimim receptivity to the energies of each planet. A basic overview of indian numerology will be covered to help students have a better understanding of the qualities of the planets and how to know the influence of the numbers and planets on one’s life. Sacred Art cultivates inner silence and attunes one with energy and essence of the divine aspect that is being evoked. This experiential workshop will introduce participants to the imagery of the Chakras, psychic energy centers, are the stage upon which the interaction between higher consciousness and desire gets played out. Coming from the Tantric tradition, these subtle centers of transformation will be experienced through painting and visualization. Participants will learn the imagery, colors, elements, deities and bidj (sacred sounds) mantras, associated with the chakra. Painting the chakra in a prescribed order, a form of meditation harmonizes the entire system as well as activates these centers of transformative energy. 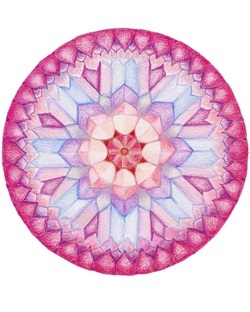 Mandalas, through their (sacred) circular energy patterns, reflect our inner nature. By utilizing the Vedic Square (an ancient number grid) you can create an infinite number of shapes and patterns to form a beautiful mandala. We will be working with specific colors and mantras related to the chakras. This meditative painting practice connects us to the subtler planetary energy governing the chakras and it strengthens our natural state of inner harmony and peace. In this course you will learn the role of colors and planets,how to use the Vedic Square to create Mandalas, how to make a Mandala based on your personal numerologyto receive maximum benefit and harmony with that planet and the recitation of Planetary Bidj Mantras, that correspond to your numbers and planets. Participants will learn to paint deities using the Harish Johari Wash Painting Technique. Painting can be done on paper or silk, using alternate layers of watercolor and gouache paints to create luminous images. 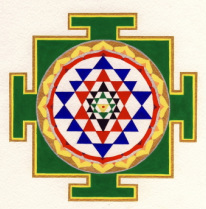 Participants will learn how to construct and paint the Sri Yantra. Mantras will be chanted as well as meditation techniques. 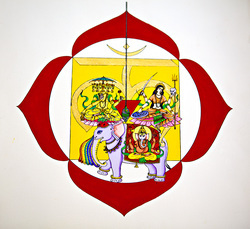 The Yantra of Swapneshwari, the Goddes of Dreams will be constructed and painted. Participants will learn her mantra and specific techniques to increase their intuition and dreams. 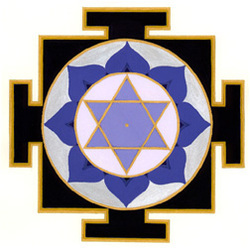 The childbirth yantra is an ancient symbol used to facilitate an easy labor and birth. Used for centuries as a meditation device by Hindu midwives to assist childbirth, this image has served as a means of relaxation for the birth canal. 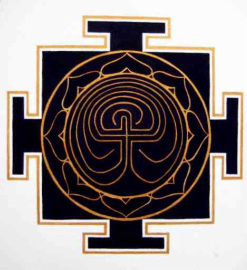 This yantra is an ancient labyrinth. It symbolizes the path of the baby out from the mother’s womb and is often hung on the wall in the labor room, so during and between contractions, the mother can follow the path from beginning to center and out again. This visual focusing tool helps slow the mind of the laboring woman and puts her in a meditative and intuitive state. 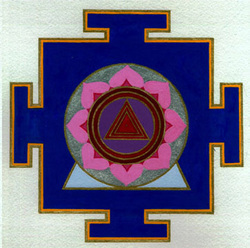 In this one day workshop you will make this powerful yantra to take home with you and learn its practical applications. This workshop is suitable for pregnant women, doulas, midwives and other birth professionals. You do not need to be an artist to paint this ancient design. As women we carry our stories in our womb, the center of life, creativity and energy. I am currently offering workshops and small groups using Mandalas to tell our stories, heal them and create powerful new ones. These workshops are suitable for pregnant women, and women who are healing from birth trauma as well as .